Seche Vite! So many people rave about it, but I never really thought a top coat could do so much until I got a bottle the other day. 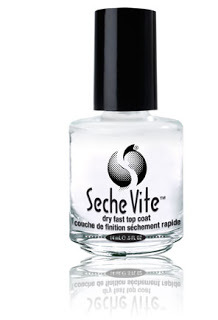 It goes right on top of wet, just-painted nails (so you don’t even have to wait!) and dries them instantly. It also makes your nails super shiny. Within an hour of doing my nails, I can take a shower, go to sleep, and wake up with a perfect, professional-looking manicure. I’m obsessed! Awesome! This could just be my new best friend!